This is the stuff that comes in sheets, but rises to create flaky layers when baked (the heat causes water to evaporate, causing the pastry to rise in layers. Puff Pastry is not to be confused with Cream Puffs which are related but made differently, then filled with a pastry cream or chocolate. Croissants and Danish Pastry are more closely related to puff pastry, but get additional leavening from yeast. I’ll admit, it’s far easier to buy frozen puff pastry than to make your own. But when you make your own, you have control over the quality of ingredients, such as using butter from local, grass-fed cows, and fresh flour that has not gone stale from months/years on a warehouse shelf. Use puff pastry for a quick tart crust, Tarte Tatin, Eccles Cakes, fruit turnovers, savory turnovers, Jalousies (authentic pop-tarts), Palmiers, strudel, and many more uses. This recipe is adapted from The Art of Fine Baking by Paula Peck (1). Bread flour is recommended because it is high in gluten. I’ve never tried this with whole grain flour, but it would be a good idea to add vital gluten if you do. After the dough is mixed, it takes a lot of time for repeated chilling and rolling of the dough to work in the butter in layers. Total of at least 8 hours from start ‘till can use the pastry in recipes. Makes enough pastry for two 8” x 13” tarts (twice as much as the Rough version, below). 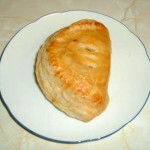 Ibiblio.org (2) has a great photo-essay on making this wonderful pastry. Before beginning, remove butter from refrigerator so it can warm a bit (but not too much). Measure flour into sifter, 2 cups at a time. Sift into bowl, then scoop back into sifter and sift again into a 2-cup measure, leveling top with a knife blade. Transfer to mixing bowl, and repeat for another 2 cups of sifted flour. Set aside 3 Tbsp of the flour. Without using flour on your board, knead the dough for 15 – 20 minutes, until very elastic and smooth. It is almost impossible to overwork the dough. While working, occasionally dip fingers into water and dab a few drops into dough to prevent it from drying. Pounding it on the table helps to achieve the right consistency. After kneading, cover dough and let it rest 10 minutes in fridge. While dough is resting, work butter into a brick about 3” x 5” x 1 ½”. Then roll the brick in the 3 Tbsp of reserved flour, coating all sides well. Place dough on large, well-floured cloth. Sprinkle lightly with flour. Now roll out the dough on the four sides, leaving the center as a cushion about the size of the brick of butter and ⅓ inch thick. The sides are like petals and are thinner than the center, about 1/4 inch thick (see upper sketch, upper right). Place the brick of butter centered on the center cushion. Stretch petals over butter, overlapping them and sealing so butter is completely enclosed. You now have a cushion of dough above and below the brick of butter. Flour dough well on all sides, wrap in foil and chill for 20 minutes. 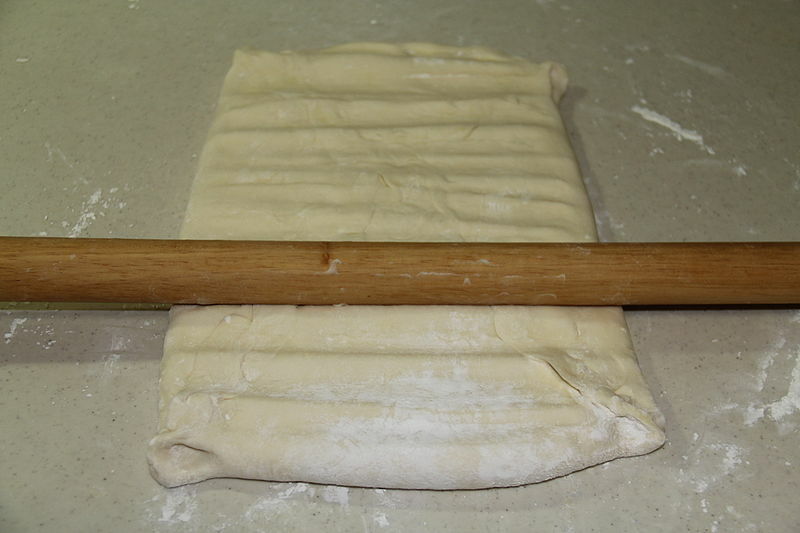 Roll out dough on well-floured cloth, rolling evenly and gently into a 8” x 18” x ⅓ ” rectangle (see photo, below, from Wikimedia Commons). Do not pound or squeeze dough. Don’t roll over ends. When it is the desired size, lightly roll across the ends to flatten to same thickness as the rest of the sheet. Brush off excess flour. Fold each 8” end to meet in the center. Roll lightly. Brush off excess flour, then fold in half along the line where the previously folded ends meet — like closing the pages of a book. This creates 4 layers of dough. (See lower sketch, upper right). Chill 30 minutes. 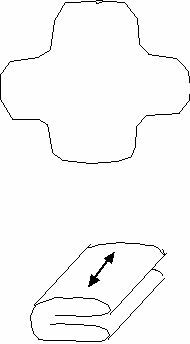 Place again on floured cloth, so that narrow ends of rectangle are parallel with the edge of the table nearest you. Roll again into a rectangle, brush off excess flour, and fold again as before. Note that this time, the folds are perpendicular to the previous folds. Repeat rolling (to 8” x 18” x ⅓ ” rectangle) and folding 3 times more, chilling dough at least 30 minutes between each roll/fold session. Total of 5 roll & fold sessions. Chill at least 3 hours before using. This simplified version of the classic puff pastry method (detailed above) is adapted from Fine Cooking.com (3, 5). See also the Fine Cooking.com video (4) on the rough method. In this method, you combine flour, salt and butter, followed by water, as you would for a pie crust. Then you roll and fold twice, chill, and roll once more before using. Makes enough pastry for one 8” x 13” rectangular tart (with raised edges), and some pastry left over for another use, or two smaller tarts. Sift flour and salt into bowl. Cut in pieces of butter until mixture is dry and rough, with butter cut to about ½” chunks. Add ½ cup water and continue to cut until dough is ‘shaggy’ and barely hangs together. Turn out onto lightly-floured pastry cloth. Pat into a rectangle and roll to about 6”x18”, flouring rolling pin as necessary. Dough will be ragged. Using pastry scraper, fold both short ends toward each other so they meet in the middle; then fold one half over the other to form a ‘book’ as in sketch in above recipe. Turn dough so fold is on right. Roll again to 6” x 18” rectangle, flouring as needed. Repeat folding technique. Then wrap in waxed paper or plastic wrap; chill for 20 minutes. 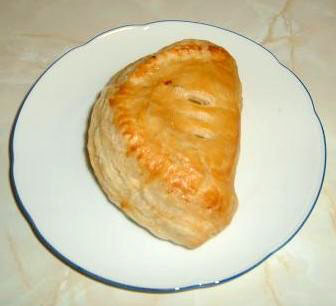 Remove dough and position again with fold on the right. Roll and fold as before, flouring as needed. Now it should be smooth with visible flecks of butter. Wrap again and refrigerate until well-chilled, about 2 hours or overnight. NOTE: if you need to divide the dough, do it before wrapping and chilling. To shape pastry for tart: After the last roll & fold, and before refrigerating the last time (above): Divide pastry crosswise into 2 rectangles, one about ¾” longer than the other. Wrap and chill as instructed above. On floured pastry cloth, roll smaller rectangle to 9”x14”. Transfer to parchment-lined baking sheet and trim edges to 8”x13”. 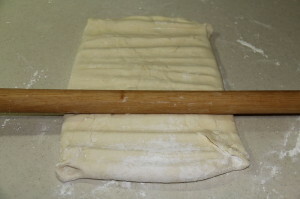 Roll larger pastry to about 11 ½” x 14” and trim to 11”x13”. Cut into four 13” x ¾” strips and four 8” x ¾” strips. (There will be some dough left over; this can be refrigerated or frozen for another use). Moisten two shorter strips with a bit of water and lay them, moistened-side down, along short sides of the smaller rectangle. Similarly, moisten two longer strips and lay along longer sides of rectangle, overlapping shorter strips at the corners. Repeat with remaining strips, stacking them on the first set. Fill and bake as instructed in tart recipe. This entry was posted in Citrus, Dairy, Fat or oil, Flour and tagged butter, flour, rolled. Bookmark the permalink.